Your sandwich looks like the perfect morning after solution to a night out. The Gorgonzola makes the sandwich for me. I could never imagine a steak sandwich without it. There's a review of the place somewhere on my blog. If you ever get to Reading and feel the need for a fry-up, that's the place to go. You've got a great blog here. 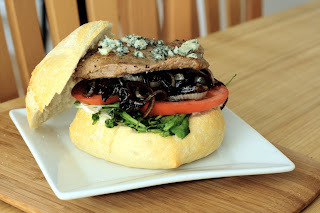 I am loving this steak sandwich and it's way to early in the morning! I'll be back often to visit! Many thanks for your kind words. Having seen your blog, they mean a lot.